The Northside Leadership Conference (NSLC) 32nd Annual Scholarship & Awards dinner June 11 at the Northside Institutional Church of God CNBE Center in Central Northside recognized Northside students, community members and businesses alike. Pride is something Pittsburghers have in abundance. But the pride on display during the Northside Leadership Conference (NSLC) 32nd Annual Scholarship & Awards dinner June 11 at the Northside Institutional Church of God CNBE Center in Central Northside ran deeper than just rooting for the city’s beloved sports teams or hoping the Primanti Bros. sandwich appears on a national “best of” list. NSLC executive director Mark Fatla opened the evening with a heartfelt statement that highlighted the Northside’s 18 neighborhoods, and explained that what truly makes it such a united area is the people, steeped in Northside pride. The event awarded scholarships and electronic tablets to 15 Northside high school students, recognized 12 outstanding community members, and honored three longstanding Northside workers with a lifetime achievement award. 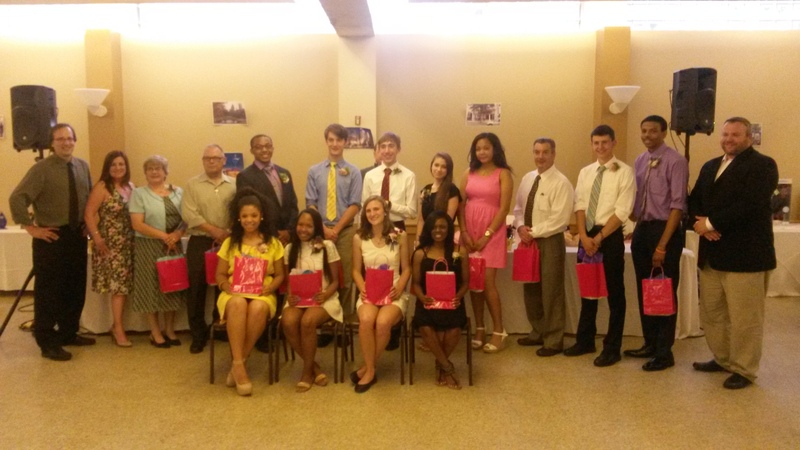 The NSLC has awarded over $200,000 in scholarships to Northside students, while the Rotary Club of Pittsburgh’s Northside provided the tablets this year. The evening culminated during the lifetime achievement awards, which were presented to Debbie Caplan of Allegheny General Hospital, Diane Annis-Dixon of Brightwood and Rev. James “Jimmy Joe” & Betty Robinson of Manchester. Caplan worked 27 years in public health, and has served as a NSLC board member since 2002 before retiring less than a month ago. Annis-Dixon was a Brightwood business owner for 16 years and heavily involved in community outreach as a member of the Brightwood Civic Group and Brightwood Merchants Association. The Robinsons have served the Manchester area through faith and education for almost 40 years. Rev. Robinson was the pastor of the Bidwell Presbyterian Church for 35 years, while Betty was heavily involved in Pittsburgh Public Schools. Fifteen Northside high school students were awarded scholarships and received electronic tablets courtesy of the Rotary Club of Pittsburgh’s Northside during the Northside Leadership Conference (NSLC) 32nd Annual Scholarship & Awards dinner June 11 at the Northside Institutional Church of God CNBE Center in Central Northside.